Google have announced that after 1st May 2010 they will no longer support ftp for Blogger (which is how I create this blog and incorporate it into visiblemantra.org) so it's going to have to move. I've got visiblemantra.blogspot.com and the easiest thing to do would seem to be to transfer it all to there and change my links. Please could you tell me what my cymbals say? I've been taking these cymbals into prison for over 15 years, to ding meditation stages. Occasionally, someone asks me what the symbols mean. I confidently reply that it is the Avalokiteshvara mantra. Only, last week a bright spark asked if it says "om mani padme hum" how come there are seven symbols rather than six? The answer is quite simple. It is the Avalokiteśvara mantra written in a Tibetan script called dbu-can (pronounced uchen) - the main formal script they use for texts and printing. The extra symbol is a paragraph marker, known as a 'shed' in Tibetan. It's more often a simple vertical stroke, but sometimes a colon-like thing as you have here. I've added the letters onto your image so you can see which is which. While we're on the subject there is no word break in maṇipadme - it is a single compound word meaning, most likely "in the jewelled lotus" (but clearly not "the jewel in the lotus" as Sanskrit grammar does not allow this meaning, despite it's popularity). I've written about this on my blog post "The Meaning of oṃ maṇipadme hūṃ". Note the Tibetans write "pa dme" as "pad me" because it looks more Tibetan. In the image below the top line is what is on your bells, and the bottom line is the proper Sanskrit, but still using the same script. 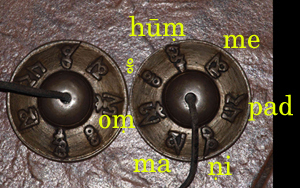 One also sees the mantra on these kinds of bells written in the Lantsa script (below). My compliments to the bright spark who spotted that there were seven symbols! This is a page from the Sarvatathāgata-tattvasaṅgraha (STTS), a 7th century Buddhist text concerning Tantric rituals. The STTS is classed as a Yoga Tantra by Tibetan Buddhists. Here we have the verso of the 15th palm leaf in the mantra containing what became the Hundred Syllable Vajrasattva Mantra. This is the oldest occurrence of the Vajrasattva Mantra (as far as the Chinese Canon is concerned). If you want to have a go at reading it - note that you read from left to right right across the leaf (i.e. ignore the columns). The transliteration shows subtle differences from the well known 100 syllable mantra. My Jayarava's Rave blog post this week is on oṃ: Mystical Grammar. I try to sort out the oṃ/auṃ thing, and look at the process of oṃ becoming an esoteric symbol. A few comments on oṃ in Buddhism, but I still find very little say about it. Over the years I've made a trickle of money from Amazon ads (about £50 a year). I'm still waiting to hit the threshold for a Google ads payout. But I've continued to put in as many hours as I could to create this resource and write my blog - sometimes to the detriment of my health. This website has become very popular (nearly half a million page views this year!) and yet it could be so much more, and indeed is part of a bigger plan to create resources for Buddhists who use mantra as part of their practice. This year I'm asking each person who visits the site for a one off donation of 50p (about US$0.80) to the website. This would provide me with enough income to work on the Visible Mantra project full-time. I hope to bring out the book of the website in 2010 - with high definition images of all the mantras on the site and a few more - and to eventually bring the website up to the same standard: e.g. to have all mantras and bījas in four scripts: Siddhaṃ, Devanāgarī, Tibetan (dbu-can) and Lantsa. I also have planned a Siddhaṃ primer and have made a start on a history of mantra in Buddhism. My aim is that Visible Mantra will also become a publishing house and will attract manuscripts from authors from a range of traditions on the subject of Buddhist mantra. I also regularly help individuals who want inscriptions transcribed and identified, or calligraphy of mantras (though I seldom do tattoos). My calculations are based on an income of £15,000 per year - this would enable me to pay all my bills and get on retreat a couple of times a year. It's comfortable given that I live communally and fairly frugally (and eco friendly) - by comparison the median annual income in the UK is about £25,000 before tax (UK National Stats). It assumes that about 20% of approximately 150,000 visitors per year (in 2009) will make a donation. Because a lot of people visit the website each person need only give a tiny amount for this to work. I hope you feel inclined to support me in this venture.